Our latest mobile product launched today on AU. 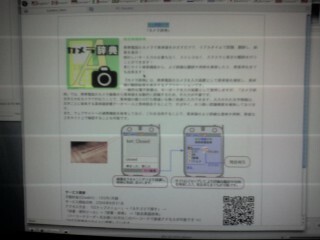 It is a Brew app that uses the phone camera to scan English words and in real time show the japanese equivalent. It even got some TV coverage organised by our partner in this product Media Seek. Our dictionary partner was CJK Dictionary Institute. Next entry: Fundoshi and Tabi! Previous entry: Are you ready? I was the TV spot yesterday. It was brief, but there was good coverage of the phone doing it’s thing. Very impressive! i am really interested in talking to you about your company’s products. my company has been working as an OEM software partner to many japanese companies over last 10 years - people like Konica Minolta, Toshiba, Sharp, Oki and others. A lot of our work is for mobile applications. I am based in San Francisco but travel to Japan often. How about talking sometime - you can drop me an email at sanjay [at] newgen [dot] net or call me at 510-676-9859. Hi Sanjay, Sorry but we do all of our software in-house. Thanks for dropping by. oops… fixed it now.. Serves me right for typing it from memory rather than cutting and pasting.